Whoops! I didn't mean to disappear without saying something about it but wow, I can barely get any time nowadays to blog. Part of the reason is that I lost the slots when I usually blog to other things. My breaks at work are replaced by more work or an actual step-away-from-the-desk break. The evenings when I usually put my blog post together have been taken over by Shreya because she is now awake for longer and of course, just as energetic as she was when she woke up in the morning. ::smh:: The nights (after Shreya finally falls asleep) are Star Trek hours because I have been watching Voyager and love that show! The next two weeks are going to be busier because we have visitors staying with us over the long weekend, so I'm probably going to be "catching up" for a long time. So, this may be that post where I'm saying I'm going to be out for some more time. We'll see - I do have a review ready so something may air up here. Since my last update, I finished three more books. My favorite from that bunch is I Feel Bad About My Neck. Nora Ephron is a wonderful essayist and an even better narrator so this audiobook was a lot of fun to listen to. After finishing this audiobook, I picked the print copy as well and will be re-reading some of the essays as I write my review. And then I need to get more of her books. I also picked up The Fangirl's Guide to the Galaxy on an impulse from the library and finished it quickly. It was a breeze to read but not filled with as much information as I was looking for. I also just finished Underground Airlines, which I had been looking forward to, only to be severely disappointed. I am still getting my thoughts together so I will not say more than I did on Litsy - it has a fascinating backdrop and a good suspense, but I found the execution poor with convenient plots. Right now, I only have one book in progress, though I am almost done with it - Sh*tty Mom. 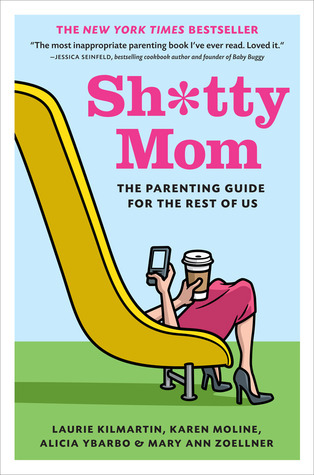 I picked it up after seeing it on Litsy and I figured one more humorous parenting book is exactly what I wanted to read (I rarely ever read serious parenting books, go figure). As with most books with essays, some essays in this book are downright hilarious, while a few are just meh. It's a quick read however and I will most likely finish it tonight. I started listening to How to Make White People Laugh by Negin Farsad - yet another find on Litsy (wow, a lot of my reads are being dictated by Litsy nowadays, for better or worse). But I haven't been listening to it in a while, so I will have to restart this one. Rather than do audiobooks right now, I am hoping to start listening to the Harry Potter and the Sacred Text podcast. I also just installed the Serial Reader app on my phone and plan to start with War of the Worlds. And in print, I may start Magruder's Curiosity Cabinet or The Yoga of Max's Discontent next.